POGO's operative in South Korea. MIA or asleep at the wheel? The first and last lesson provided to POGO's Man-In-South-Korea, Stuart Smallwood, was provided 2 days ago, but has not yet been posted in his thread. Whether he has not had time to review the comment, is formulating his response prior to posting, or awaiting further guidance from CINC POGO, I have no idea (or really care). If POGO/Reformer modus operandi holds in this case, expect either no response or emphatic misdirection or mischaracterization on some related point. I provided Mr. Smallwood with the following, as I believe it was the second-lowest hanging fruit and I'm rather pressed for time these days. I believe the only changes are those that allow me to format and link differently in a post vs. a thread elsewhere. If I DO eventually 'fisk' the total drivel POGO spoon-fed him, I will probably do so in the larger context of the battle of ideas and as battlefield prep for deflating future POGO spewings. 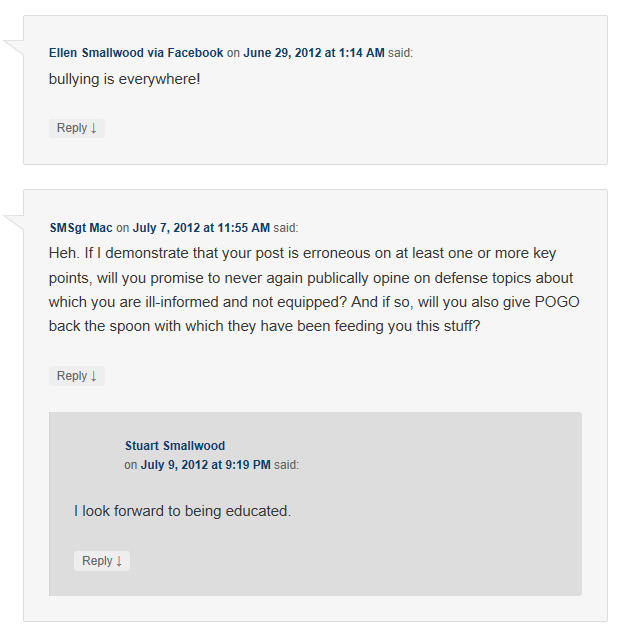 The remainder of this post is what I commented on at Smallwood's blog. Note: I am somewhat curious as to how South Korea views foreign nationals trying to influence South Korean policy decisions while they are guests within South Korea. While not a big deal in the US (Apart from 'shut up--you stupid foreigner!' criticisms), in many countries that kind of activity is taboo (Mexico comes to mind). First– some background since you are new to the subject. WW has been peddling this ‘too heavy’ trope ever since the Fighter Mafia failed to keep more advanced systems off the F-16. If the Mafia had their way, the F-16 would still be a one-trick-pony-day-fighter. WW and Co. habitually frame air combat as either BVR or ‘close-in’, magically moving past that period of initial closure where “who detects and targets who first” is paramount. We don’t even have to get to the parts WW/POGO never talk about here. Let’s debunk the ‘too heavy’ notion up front. So there you have it. The first operational pilot to qualify on the F-35A, who is also a Weapons School grad, and has been an F-16 OT&E pilot... gives a big ‘thumbs up’ to what LM and the JSF program have been telling us all along. Expect more glowing pilot reports. From this operational pilot we receive confirmation that the F-35 is only about as ‘bad’ as the aircraft it is replacing, which is exactly what it was designed to be, and OBTW means it is on par with an aircraft that is still one of the world’s premier dogfighters (F-16 is especially ‘hot’ below 20000 ft). Now let me add just a little of my own aeronautical (BSc, MSc, Decades of flight test, etc.) knowledge for your ruminations. What LtCol Kloos didn’t mention (because he probably doesn’t know) is the true F-35 effective wing area and loading. Neither does WW, any other so-called ‘reformer’, or any outsider. Because the fuselage itself creates lift and adds to the effective wing area. Wing area is the 'denominator' in the wing-loading figure of merit. Outsiders can only make WAGs as to the wing loading and in turn the maneuvering capabilities of the F-35. They are even bigger WAGs if they don’t know the Lift/Drag ratio, total drag, or installed thrust of the engine at varying power settings and airspeeds. Also, because the F-35 will fight ‘clean’ without external pylons and weapons on ‘Day 1’ of a conflict, when it enters into a tight turn it will have a fraction of the parasitic drag of an F-16 or any other non-LO aircraft. In all likelihood, the F-35 will bleed off a lot less speed performing the same turn as an F-16. It would have been a shorter lesson If I had just chosen to debunk the “It’s too fast to find targets or distinguish enemies from friends on the ground” canard (I can provide if desired). But the Fighter Mafia ‘simple is better’ talking point mindlessly parroted by a long-disenfranchised Congressional staffer with ZERO technical qualification always deserves a good smack-down. I may just take down every-stinking ‘point’ the POGO boys fed you at my place later, but I’m getting bored with exploding their logical fallacies. Sorry it took so long to respond. Work, family, and a Crankshaft Position Sensor took up the bulk of my time this week.